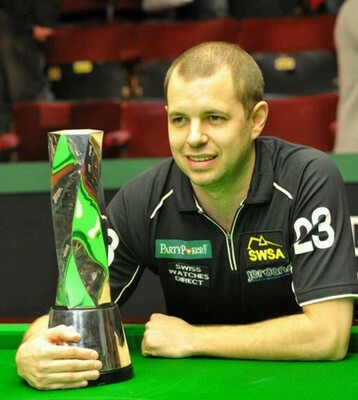 Shoot-Out Day 3: Barry Hawkins crowned in Blackpool after beating Graeme Dott in the final 61-23. The 32-year-old from Dartfold defeated Ding Junhui, Fergal O'Brien, Stephen Maguire, Mark Davis and Dave Harold en route to meet Graeme Dott in the final. In the final, Hawkins was first in with 46 before missing a red to let Dott in. 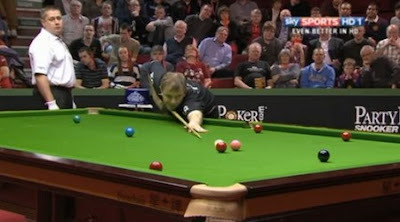 However, the 2006 World Champion just made 8 with the chance which allowed Hawkins to score again. Hawkins beaten Dott by 61-23 to win his first title in his 16-year professional career. "It's a brilliant feeling, definitely the best moment of my career so far, I've played in big matches at the Crucible, but to win a tournament live on television is amazing. It's a shame there were no ranking points but I'm still delighted." Hawkins will collect 32000 pounds for the top prize, "The money is amazing, especially as I'm getting married in June (to Tara) in Dartford. This will pay for the whole thing and we'll be able to have a great day." Total clearance of 135 in the last 16 helped Martin Gould to win the highest break prize of 2000 pounds, replacing 122 made by Stephen Lee yesterday. Barry Pinches made an incredible comeback in the last 16 against Liang Wenbo - He was 1-41 down with about three minutes left and he trailed 37-41 when about 30 seconds left. Liang perhaps should play a safety but he went for the double, leaving a loose red over the top right pocket. 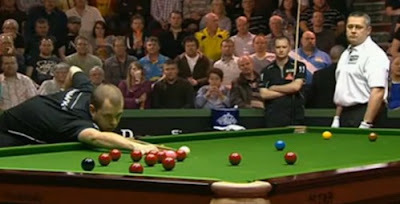 Hawkins potted the red and then the blue in the last second to beat Liang 43-41. Unfortunately, his amazing run was stopped by Tom Ford in the quarter-finals who made a break of 82.